PATIENTS at the Royal Free Hospital say they are so aggravated by its car park fees they would rather take a bus or pay for a taxi. The hospital in Pond Street, Hampstead, raked in nearly £350,000 last year, a £50,000 rise on 2005/6 after employing two parking attendants to ensure visitors bought a valid permit. The charges were set at £3 per hour in 2003 because commuters and shoppers were using the hospital as a car park, the hospital’s NHS trust claimed. The Royal Free has allocated seven parking bays for radiotherapy patients to use and disabled badge holders have free parking in all other spaces, but patients without a permit must pay a fee. Interior designer Larraine Dovey, who lives in Fitzroy Road, received radiotherapy treatment at the hospital last year. She said: “Within weeks of being diagnosed with a very serious illness you’re in hospital. Paul Greenbaum parked his car in the car park’s access road while waiting for his wife who has been suffering from heart problems and cataracts. 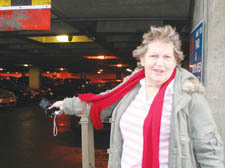 Norma Sedler, who lives in Hillfield Road, West Hampstead, was visiting the hospital for a blood test. A spokeswoman for the Royal Free said that the revenue raised from charges in 2006/7 represented just 0.5 per cent of the trust’s total income.